This villa is designed specifically with outdoor living in mind and allows you to enjoy the spectacular views and cooling trade winds from each and every room. The living room has an interior ridge height of 20 ft /6 mtr to emphasize the loft style and open, spacious area. 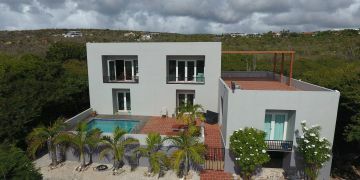 From the covered porch (spacious to live outdoors independent of weather conditions) you have almost 180 degrees views over Bonaire, Klein Bonaire and the Caribbean Sea. Due to depth of the porch (10 ft / 3 mtr), the sun can not shine directly on the windows, which are oversized to create spaciousness from inside to outside. 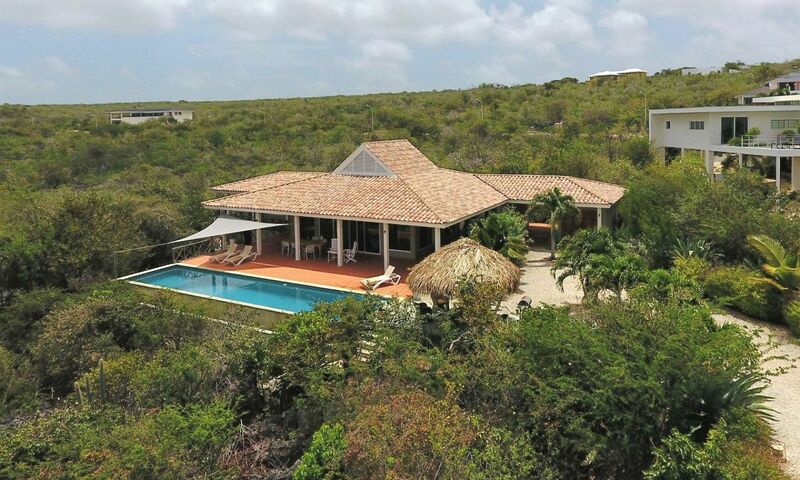 This villa can easily accommodate 6 people without compromising privacy or living space. Entrance via covered porch through sliding doors into living room, equipped open kitchen with cooking island, three bedrooms (of which one serves as a separate guest suite) with private bathrooms en suite, half bathroom, infinity pool with wide deck and outdoor shower. Carport with separate storage room. 60 Liter hot water boiler. Registered at the Land Registry Office Kadaster, number 4-A-1245.